Samdech Akka Moha Sena Padei Techo Hun Sen, Prime Minister of the Kingdom of Cambodia, this morning held bilateral talks with H.E. Joko Widodo, President of Indonesia, on the sidelines of “the 10th Anniversary of the New Asian-African Strategic Partnership Summit” and “the Commemoration of the 60th Anniversary of the Asian-African Conference” in Indonesia. On the occasion, H.E. Joko Widodo expressed thanks to Samdech Techo Hun Sen for his participation in the above-said international events and proposed Cambodia to open its market for Indonesian products, especially machinery, motors, and medicines, the National Television of Cambodia (TVK) reported. H.E. Joko Widodo also raised his intention to open Indonesian gasoline stations in Cambodia and establish direct flight between Cambodia and Indonesia. For his part, Samdech Techo Hun Sen expressed his support to the request of H.E. Joko Widodo to increase the bilateral trade exchange between both countries which reached recently only over US$600 million. The Cambodian premier suggested the discussion between the ministries of foreign affairs of both countries so as to push for the establishment of direct flight between the two countries, and requested the Indonesian side to continue assisting Cambodia in human resource development. Samdech Techo Hun Sen also agreed with H.E. 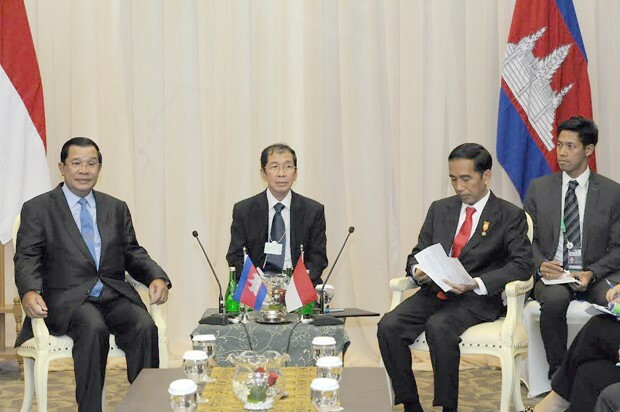 Joko Widodo’s suggestion to continue the cooperation in combating cross-border crimes. Samdech Techo Prime Minister took the opportunity to present His Majesty the King of Cambodia’s letter to the Indonesian president and invited the latter to pay a state visit to Cambodia in an appropriate time.